Virginia J. (Lambert) Morse– of Wilmington, Sunday, April 14th. Beloved wife of the late George A. Morse Sr. Cherished mother of George A. Jr. of Kingston, NH, Dennis P. and his wife Marcy of Wilmington, Michael J. his wife Denise of Tewksbury, Donald B. his wife Susan of Wilmington, Susan V. Morse, her companion Richard Valentin of NH, Colleen M. Morse, her companion James Zechello of Easton, and Stacey M Silverhus, her husband David of Derry, NH. Loving sister of the late Ronald Lambert, his wife Jean. Loving “Nana” of 17 grandchildren and “Great- Nana” of 14 great-grandchildren. A Prayer Service will be held in the Lynch-Cantillon Funeral Home, 263 Main Street, Woburn on Wednesday evening at 7 p.m. Interment is private. Relatives and friends are respectfully invited to Calling Hours, Wednesday evening 3-7 p.m. prior to the service. In honor of Virginia, remembrances may be made to the National Dementia Organization, 1100 W Norway Ave, #108, Mitchel, SD 57301. Virginia J. (Lambert) Morse passed away at the Care One Nursing Center in Wilmington, Sunday April 14th. The beloved wife of George A. Morse Sr., she was eighty five years old. Born in Boston, she was the daughter of Joseph and Virginia (Lambert) Ferranti. Raised and educated in Burlington, Virginia graduated from Burlington High School along with the Class of 1951. In 1952 she married George Morse, whom she was introduced too by her grandmother. They lived in Woburn briefly and then bought their home in Wilmington, where they remained. Seven children blessed their family and this certainly kept Virginia extra busy. On their land they had horses, which every one of the children learned to ride and care for, growing up. When the children were all in school Virginia would often work for a catering company or other little odd jobs, just to get out of the house for a bit! As the years went by she became the proud “Nana” of seventeen grandchildren and thirteen great grand children! She was also very proud of each and so enjoyed being surrounded by her family, particularly at the holidays. 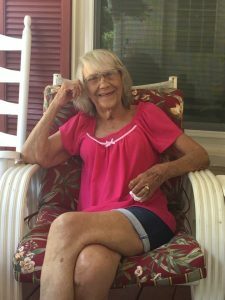 A rather quiet woman , Virginia enjoyed listening to country music, reading a good book of any genre and doing all sorts of wonderful crafts that she made for her family and friends. Virginia was a very kind, thoughtful and caring woman. Her family was her world and she enjoyed them all, right up until the end. Virginia is lovingly survived by her children, George A. Jr. of Kingston, NH, Dennis P. and his wife Marcy of Wilmington, Michael J. his wife Denise of Tewksbury, Donald B. his wife Susan of Wilmington, Susan V. Morse, her companion Richard Valentin of NH, Colleen M. Morse, her companion James Zechello of Easton, and Stacey M Silverhus, her husband David of Derry, NH. Loving sister of the late Ronald Lambert, his wife Jean. Loving “Nana” of 17 grandchildren and “Great- Nana” of 14 great-grandchildren. A Prayer Service will be held in the Lynch-Cantillon Funeral Home, 263 Main Street, Woburn on Wednesday evening at 7 p.m. Interment is private. Relatives and friends are respectfully invited to Calling Hours, Wednesday evening 3-7 p.m. prior to the service. In honor of Virginia, remembrances may be made to the National Dementia Organization, 1100 W Norway Ave, #108, Mitchel, SD 57301. A Prayer Service will be held in the Lynch-Cantillon Funeral Home, 263 Main Street, Woburn on Wednesday evening at 7 p.m. Interment is private. Relatives and friends are respectfully invited to Calling Hours, Wednesday evening 3-7 p.m. prior to the service. In honor of Virginia, remembrances may be made to the National Dementia Organization, 1100 W Norway Ave, #108, Mitchel, SD 57301. One of the best women to walk the earth with us. Much Love to all my family. I send you Prayers and Strength to you all in this time. You will be missed aunty xox. I’m so very sorry for your loss. What a beautiful, kind woman with a wonderful smile. May you all find peace in your memories & love for her. Prayers for the Morse family . Sorry for your loss. Sorry for your loss. My thoughts and prayers are with you all. You were my 2ND Mom. Always there for me. God Bless you and Fly high with GiGi! Give him a hug and kiss for me. xoxo Love you Mom! Sorry for your loss Sue. Prayers for you and your family.